Here's an excerpt from chapter 7 (Take a Look at Yourself in the Mirror) of my new book, The Young Athlete's Guide to Playing Sports. This chapter's lead topic presents helpful information on the different ways to succeed in sports, and how you can find your own best path. Success in sports comes in different forms. The most obvious one is derived from your ability to play a sport well. You win. Your team wins. Everyone wants to play with you. How do you become one of these players? The best athletes are usually gifted with “natural” athletic talent. They typically have physical attributes (size, strength, speed) that set them apart from others. They may also have exceptional motor skills (hand-eye coordination). But here’s an essential truth you need to understand: natural talent alone does not determine success in sports. Although it often accompanies success, it’s only one ingredient in the mix of qualities that define a winning, competitive athlete. As previously discussed, hard work (practice and preparation) is also necessary to shape one’s talent into effective play. Likewise, good coaching and instruction help transform raw talent into a more refined product. Other more intangible qualities also play an important role. 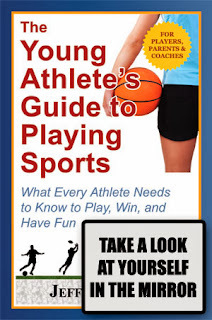 The “will-to-win,” ability to learn, and tactical intelligence, all help define an athlete’s prospects for success. You should also appreciate that talent isn't absolute—it grows or shrinks relative to circumstance. In youth, it’s often relative to one’s physical development. You may physically mature earlier or later than others your age. “Stars” at the youth level may dominate because they are bigger, taller, or stronger. But like runners who charge to the front at the start of a long race, only to quickly fall back into the pack, their advantage is frequently short-lived. No longer tall or strong for their age as they and others mature, their talent (in this case a physical advantage) disappears. Although natural talent helps one excel at playing sports, it’s not a prerequisite for success. There are other ways for an athlete with less talent to succeed—ones that an athlete can learn and control. The measure of one’s talent is also relative to the level of competition. Middle school stars who possess outstanding skills may find that this talent alone isn't the path to success when they graduate to high school. Many others may now have similar abilities—ones that were regarded as exceptional at lower levels. Consider professional athletes. At lower levels, most were exceptionally gifted athletes. But at the elite professional level, many are now viewed as having limited athleticism. Their talent is less remarkable. Yet despite their diminished relative ability, many of these professional players still enjoy great success. For example, from 2006 through 2008, a decidedly non-athletic Jason Kapono found success in the NBA because of his ability to make 3-point shots. Tom Brady did not become one of the best quarterbacks of all time because he is a physically great athlete. (His NFL combine results, including a 5.28 40 yard time, were some of the worst ever recorded for a quarterback.) Instead, he adapted his play at the professional level to counter the quicker, faster, and stronger NFL defenders. He learned how to more quickly process patterns of play and make the right decisions. These players all find other ways to play their sport well; their path to success changes. They may excel in one area of play—possibly one that is crucial to the success of their team. They build upon their experience and countless practice repetitions; their minds have a fuller grasp of how to play the game, enabling them to more quickly take advantage of opportunities that present themselves during a contest. They may also have greater mental discipline to both prepare and persevere. They’re better conditioned. They work and play harder. Their will to win is strong. If you’re a young athlete who wants to play competitive sports, your path to success will likely resemble the one just described. Few athletes consistently win throughout their career by relying on their athletic talent alone. Instead, hard work and the other qualities described above come into play. And this is good news for you and every other young athlete. You can develop and control many of these other qualities!